We all get roles in an organization. One role that is especially important is that of the “strategist.” Sometimes this is a distinct role occupied by one person or a strategy group. In other cases, it could be the boss or a marketing person that has this functional assignment. No matter what the embodiment, it is critical that the strategist execute well for the organization to prosper. So how can you tell how your strategist is doing? There are some 5 simple criteria that will answer that question. Grade your strategist in each category and you will be able to assess their performance. And remember that their performance may well impact you no matter what your role. The vision is about a specific, explicit destination. An organization wants to know where it is going and the strategist has a large part of the responsibility to explain that destination. It might be expressed in market terms (e.g., we want to be number 1 or 2 in every segment that we are in) or in impact (e.g., we want to make the world’s information available to everyone) or something else. Whatever it is, an effective strategist has to have a destination description. And the description has to be useful as a guide for those that must be supportive of the strategy. If you feel like the organization is wandering about, perhaps this description is missing (you don’t want to be an Alice). A learning disposition solidifies the strategy foundation. A strategist is unlikely to already know everything necessary to formulate the strategy so they must master the identification, integration and interpretation of important information. Often this involves working with and through many specialties in and out of the organization. There may be product information, demographic trends, technology developments, competitor positions and many more things to consider when formulating a strategy. Successful strategists are especially curious and versatile. Conversely, low marks are deserved when a strategist demonstrates limited ability in incorporating information and is averse to learning. It is a combination of high intelligence and humility that empowers a strategist. Look to see how your strategist regularly tests the foundation of the strategy with what they learn. 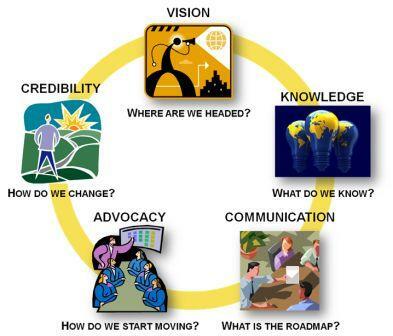 A clear roadmap communicates the way. There are good reasons to have a map. If it is doing its job, it pinpoints where you are and helps you understand the way to your destination. Without the map that you can examine and follow, the most attractive destinations remain pipe dreams. You can tell if a strategist is doing a good job if there is a map for the organization to follow. Check to see that there are appropriate versions for different audiences that explain what each needs to know. Also check to see if there are checkpoints along the way where the strategist realigns the organization by reminding them about the reasons for the strategy journey. Finally, test your strategist by asking to see the written version of the strategy. All too often when there are only verbal versions of the strategy your strategist’s thoughts are unclear or quickly shifting. Persuasion puts the organization in motion. Every organization has some inertia. This can be a good thing until it is important to move in another direction. And a strategist often needs to move the organization in a different direction. The ability to convince people within the company culture is essential. Good strategists as constantly determining how change happens and how to influence that change to support the strategy. They become change artists that look for supporting energy to help move the organization. Ineffective strategists fall back on lazy assertions that the elegant solution, beautifully expressed is enough to effect change. Look for the strategist’s approach to change, how they engage with the culture and how they recruit allies to help with change. These things will give a good indication if their persuasive skills will be enough to get the organization moving along the roadmap toward the vision. Credibility is based on overcoming problems. Every significant journey is likely to have challenges. Sometimes these challenges come from naysayers within the company. Maybe external conditions will alter important underlying assumptions. The execution of the strategy may become a problem if new processes or technologies must be mastered. And there are a thousand other possible problems. Here is the key for a successful strategist. They will assume that there will be problems. Their credibility will not rest on perfect strategy rather it will be founded on the proof that problems can be overcome in pursuit of the vision. Inexperienced or poor strategists will lose their nerve or abandon the vision prematurely. When they do this, the strategy will fail and their personal credibility will suffer. So there it is. Assess your strategist and you will get a useful indication of where your company is headed. If they deserve good grades then you can deduce that their strategy might be sound. On the other hand, if their work merits low grades over a sustained period, then run for the hills. If you are the strategist, think about how you might improve in each area. That is a topic for another day. I worry that you have created a troublesome contradiction for yourself. You seem to be inviting us to assess our strategists. This implies that you believe we are competent to perform that assessment. BUT, if we are competent to do that, that implies there is nothing much special to being a strategist. Is doing strategy easy or is it hard? Can any non-specialist judge a professional strategist? >>Is doing strategy easy or is it hard? Both. Depends on what kind of strategy and who is doing it. >>Can any non-specialist judge a professional strategist? Of course. Happens all the time. If we weren’t free to judge the performance of others outside of our specialty we would be in sad shape. We judge presidents, basketball coaches, figure skaters, etc., when most of us get nowhere near those professions. As for strategists, I contend that they they (like senior management) can have a large influence on the success of an organization. If we see some repeated dysfunctions, it makes sense to be a little concerned. Maybe your point is that most people cannot judge the strategist’s performance in a detailed way since they are unfamiliar with the professional tools, techniques and challenges of strategy. I suppose that I agree with that point (if that was your point).